Especially important in challenging economic times, you can save bundles of money by grooming your dog yourself. I have saved thousands of dollars grooming my two dogs over the last five years. My two Shih Tzus are happiest with short hair, which required a visit to the groomer every other month at about $50 per dog — that added up! well…homely, especially for beginners. 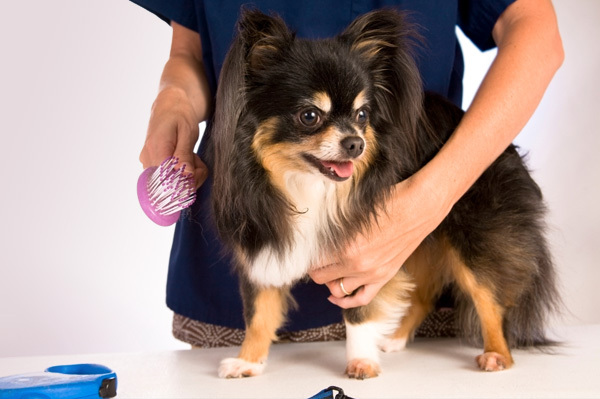 So, if the perfect doggy hairdo matters to you or your dog, leave it to the experts. seconds because of a bad back. No wonder one groomer stopped returning my phone calls! buy at your local pet store, but check the return policy in case you need to upgrade. For actual grooming techniques, many clippers include a how-to DVD with step-by-step instructions. Also, check for books at your local library or bookstore for breed-specific advice. clippers I bought. Also, you will need to buy blade lubricant to maintain the clippers, although some clipping kits include this. Small dogs in particular are prone to unsightly eye discharge, which requires daily upkeep. Rinsing your dog’s eyes with plain contact saline works well; just catch the runoff with a tissue. Keeping the area trimmed prevents the eye gunk buildup that can lead to infections and corneal scratches. training, whether from a groomer, vet or knowledgeable friend. that simply trimming the hair does the job. I’ve tried both and actually had more success with a careful clipper trim. professional groomer empties these glands externally during your dog’s bath. If you think your dog has any issues here, check with your vet before trying this at home!